AEF 1.0.9 is ALIVE happy re-birthday ! Welcome to the AEF Board. AEF is getting better and better and is also becoming more popular. Take a few seconds to Register, its free, and it inspires us to work harder and improve on whatever we can improve on. Give us some feedback, and tell your buddies about AEF! This is just a quick message to let you know that these official AEF forums have been upgraded to the first preview of AEF 1.1.0. There are still a lot of changes to be made, including plugins and more Akismet functionality - along with a whole new default theme. We're getting there! first, i want to thank you all for being with us all this time, without you we would've not done what we have done we would have failed, so thank you. one a lite, and another one as premium. the premium version will be the cheapest in the market, we are aiming to make everyone able to pay for it. I am pleased to say that recently we have been given the rights to do our initial intents of releasing a more stable, bug free and more developed bulletin board. Currently, we are working on AEF 1.1 along side of AEF 1.0.9. AEF 1.0.x series is now feature locked. All feature suggestions will be considered for AEF 1.1 series. We hope to release AEF 1.0.9 sometime during May which will consist of a few new features but most of all, bug fixes. Last time we asked you to report spam posts, either spam bots reported legit posts or no body could tell the difference between a spam post and a legit post :). Please report any SPAM POSTS you find so we can delete those and make this forum a little more of a community forum and not a spam haven. If you find any bugs, please also report the bugs so we can get those fixed in AEF 1.0.9. So it's time to rebuild AEF into the great bulletin board it used to and was suppose to always be. Permissions on the announcements board has been fixed to prevent spam announcements, also, you are now required to validate your email address upon registering which will decrease spam posts. The team is trying very hard to delete all teh spam in posts, sadly, we don't have the work force to find every single post replied in all these threads for the period of two years so if you find any spam simply report it so we may deal with it. We would like to thank the PHP Resource Index and HotScripts.com for listing us on their site. AEF LOVERS Please vote for us at the above links and if possible write a review about us. 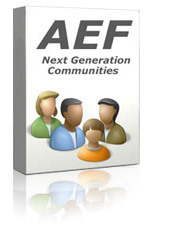 This will help AEF gain popularity and will help grow the AEF community. All times are GMT. The time now is April 24, 2019, 12:16 am.